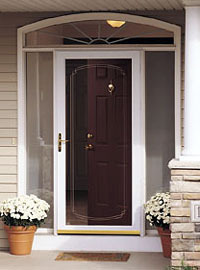 Build your own storm door - select the color, decorative glass design, and a solid brass handle style. Available in Fullview frame styles. 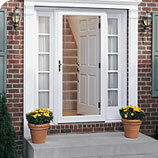 Feature maximum glass area to brighten your entryway and showcase your entry door. Switch from glass to full screen to bring in the breeze. Choose from three Fullview frame styles. Feature 1 5/8" overlapping aluminum frame with rigid insulation and double weatherstripping for a tight seal. Plain and beveled glass styles available. Feature contemporary frame design to allow maximum light into your entryway. Switch glass to full screen to let the breeze in. A solid brass handle adds elegance to your entryway. Feature maximum glass area to bring light into the entryway. An overlapping frame offers a clean look and double weatherstripping for a tight seal. Switch glass to full screen to let the breeze in. A solid brass handle adds style to the entryway. Feature an architectural frame design with decorative accents. Overlap frame conceals gap between door and entryway for a clean look, and double weatherstripping ensures a tight seal. Elegant solid brass handles add distinction to the entryway. Plain and beveled glass styles available. A Pella exclusive. Glass panels operate with fingertip ease and stay in any position for safe, easy ventilation adjustments. Available in Fullview and Midview frame styles. Feature the convenience of self-storing ventilation for instant air flow adjustments. Raise or lower the glass panels to get just the right amount of breeze. 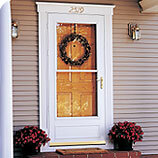 Choose between doors with brass handles and accents or color-match the handle to the door. Add a touch of elegance to your home. Feature brass handles with Lifetime Finish Guarantees and brass bottom expanders. Available in Fullview, Midview and Highview frame styles. Feature handles and bottom expanders color-matched to the door for a uniform look. Available in Midview and Highview frame styles.